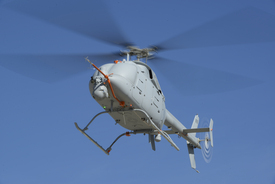 Northrop Grumman Corp. and the U.S. Navy successfully flew the second MQ-8C Fire Scout unmanned helicopter for the first time, the company’s division in Rancho Bernardo announced Thursday. The test was conducted Wednesday at Naval Base Ventura County in Point Mugu, Calif. Current tests are focused on validating the flight capabilities of the aircraft before ship-based flights take place this summer. An MQ-8C Fire Scout unmanned helicopter. Northrop Grumman photo by Alan Radecki. “The addition of the second MQ-8C means we can begin testing on more components and equipment needed to operate the system as an intelligence-gathering platform,” said George Vardoulakis, vice president for medium range tactical systems at Northrop Grumman. Fire Scout uses on-board sensors to capture full-motion video, identify targets and then distribute the information in real time to various users. This allows ship-based commanders to maintain awareness of a specified area or keep an eye on a target of interest for long periods of time. Vardoulakis said testing of the first aircraft began Oct. 31 and the company has since completed 41 flights totaling 66 hours.